After failing to show up at a major American cemetery in France at least our president did not add to his shame by failing to show up for the big show with 60 or so other national leaders at the Arc de Triomphe for the official ceremony marking the centennial of the 11th hour on the 11th day of the 11th month of November, 1918, when the guns fell silent on the western front of World War I, officially ending it in the eyes of most historians, even though fighting would escalate in certain other important zones whose outcomes still shake the world, most notably between Greece and Turkey, with the dissolution of the Ottoman Empire coming out of that leading to many wars since, some of them gong on right now. We get it that Trump was uncomfortable given that President Macron was lecturing against the sort of nationalism that led to WW I, with a three day forum to follow that Trump will run as fast as possible back to the US to avoid. And, hey, Macron did not even have tanks and missiles for the parade this time, which Trump really likes to see. This important day, the first Armistice Day, which we renamed Veterans Day in the US after the War to End All Wars’ unfortunate sequel (actually in 1954 right after the end of the “forgotten” Korean War) and have since turned into one of those Monday holidays, has turned into a curiously sad one personally. It involves another war, Vietnam. My cousin, Bill Atwater, died yesterday, the day before this serious centennial and also the 243rd birthday of the U.S. Marines. Yes, Bill was a Marine and was in Vietnam where he was exposed to Agent Orange that led him to have various cancers that basically led to his death, although it was an opportunistic pneumonia that finally actually did him in. He will be cremated with his ashes spread over the cemetery at Arlington. I had not communicated with him directly for over 20 years (did through another cousin), but he told me at his mother’s funeral that he had been spat on when he returned to the U.S. I have more recently seen stories that such reports were exaggerated, if not outright true. As it is, I have no way of checking on Bill’s story now, but I know that he was a multiply wounded man. In any society not in a state of civil war, shame is a powerful force, perhaps the most powerful. Individuals or organizations caught cheating, lying or otherwise doing evil, when exposed and called out, are expected to be embarrassed. They should repent their sins and promise to make amends. Other than pure coercion, what else can disarm those who violate the norms of society? Evolutionary biologists tell us shame is hardwired not only in humans but many other social animals. (They may not experience shame the same way humans do, but the outward markers and consequences are the same.) We seek group membership in good standing, and while there is an incentive to exploit others for personal gain, or just relax our commitment for a while, the punishment of group rejection is a more powerful force. That’s what holds us together. It is natural that shame is invoked as a political weapon. Corrupt businessmen, politicians and public officials may be flying high, but if we can document the facts they are trying to hide, we can clean them out. A video documenting otherwise hidden police abuse, an audio recording of the murder of civilians released by Wikileaks, the disclosure of evidence of law-breaking by justices or political leaders should accomplish this. Also testimony from women abused by powerful men: if they come forward and tell the world what really happened, that should stop abuse in its tracks. Now that the 2018 midterm elections are behind us, let’s take a preliminary look at 2020. 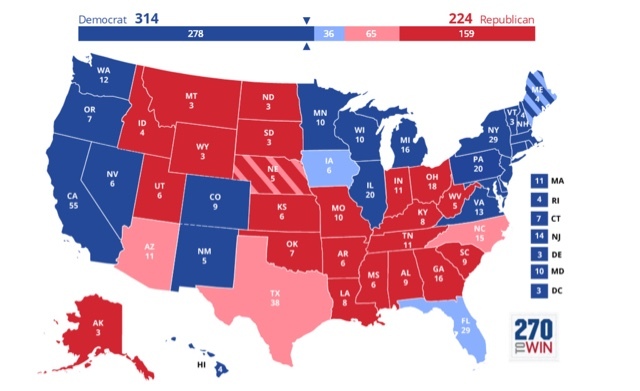 It occurred to me that a decent baseline for that election is to simply take the total 2018 House votes for each state, assume that the Presidential vote in 2020 in each state will be the same, and apply that to the Electoral College. Alternatively, you could use the results of the 2018 Senate races in those states where there were races in 2018, and apply those results for those states. That’s because the midterm turnout approached Presidential election levels, and Trump is going to engender the same intensity in two years as he did this past week. 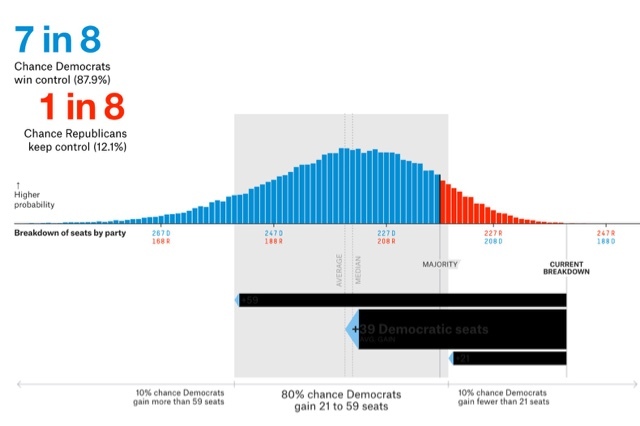 By contrast, in 2010, a smaller vote advantage led to a 63 seat gain for the GOP. As I wrote a few weeks ago, whatever message Congressional GOPers might have wanted to put out (like, “our tax cuts helped spur the best economy in years!”) got stomped on by Donald Trump. Trump blamed the press (and even the victims for not having armed guards in their place of worship! ), and amped up the anti-immigrant volume, thus guaranteeing the the ugliest face of the GOP is what has been last shown to the public before Tuesday’s polling. 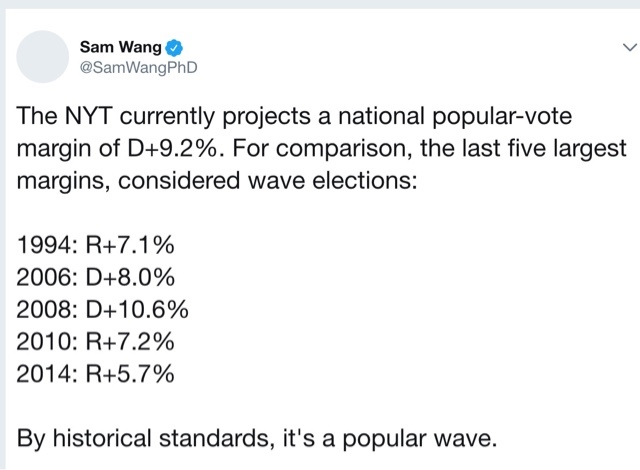 I’ll update this post with Gallup’s final pre-midterms weekly number when it comes out tomorrow.